Pictured, left to right: Kathryn Strachecky, Prince’s Trust Mentor; Bev Hurley CBE, CEO of YTKO; Bridget Lovell, Deputy Lady Mayoress of Bristol; Tim Bowles, West of England Metro Mayor; Fiona Fraser, GetSet for Growth Senior Marketing Advisor; Toby Howkins, Outset Enterprise Advisor; Victoria Matthews, Business West Advisor. Business creation and growth experts YTKO Group had a fantastic day at the Business Showcase South West event that took place on Wednesday 11th October 2017. Hosted at Ashton Gate Stadium in Bristol, this event is key in the business calendar and YTKO was proud to hold a double stand and keynote speech for the Enterprising West of England consortium. With 5,000 visitors filling the stadium, the consortium showcased some of their brilliant success stories and the support that they have to offer, including YTKO’s award-winning GetSet for Growth and Outset programmes. Speaking face-to-face and building relationships of trust and respect with the business community is a vital aspect of both programmes. Outset offers start-up support to budding entrepreneurs through a range of one-to-ones with enterprise advisors and various workshop sessions, whilst GetSet for Growth offers growth support to ambitious business owners similarly through one-to-one support with specialist marketing and finance experts and practical events. The ability to see clients go full circle, from first introductions at networking events, to then holding an exhibitor stand to promote their business, is always a proud moment for YTKO and really puts the value in the successful work of the teams. CEO of YTKO, Bev Hurley CBE, was a keynote speaker at the Business Showcase event where she discussed the journey to success in business, including her inspirational story of over 30 years’ experience in building companies. 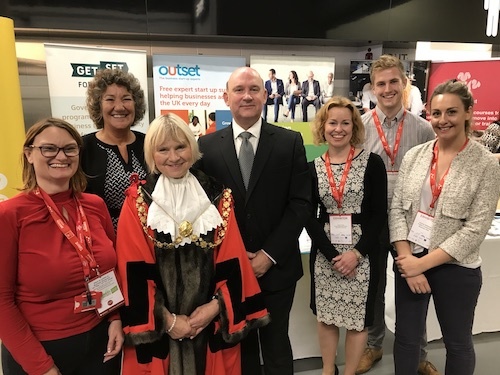 Many SMEs at the event had travelled to hear Bev speak, along with Tim Bowles, West of England Metro Mayor, and representatives from both Facebook and Google. This fantastic line-up of speakers certainly provided attendees with plenty of expert insights at the event. YTKO is looking forward to attending the next Business Showcase South West event on Thursday 17th May 2018. You can book your place at GetSet for Growth West of England’s upcoming events here. GetSet for Growth and Outset West of England are part of the Enterprising West of England project funded by the European Regional Development Fund, delivered in partnership with Business West, The Princes Trust and the four local authorities across the region, including North Somerset.